Q How soon can you deliver? A All goods are dispatched the same day for next day delivery. Q What happens if your alternative cartridge damages my printer? A We would send out one of our engineers to fully investigate the damage to your printer. This investigation will take place at our office whilst we leave you with a temporary replacement. Once we have established that our cartridge was the cause of the damage we will fix your printer if possible or replace it. A We are open from 9:00 am - 5:30 pm. A You can pay by card or cheque, we can always find a more suitable method of payment to meet your needs. A For businesses we require a credit application form to be completed, we then expect payment within 7 days for the first three orders, following this you will be given 30 days credit. Q We have many offices but we do all our purchasing centrally from head office, can you deliver to any one of our offices? A Yes this is something we are already doing. 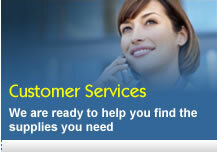 We provide on going support for your purchasing team and always look for cheaper alternatives to help you cut costs. Q What is our Returns/Refund Policy ? A You have 14 calendar days to return an item from the date you received it. To be eligible for a return, your item(s) must be unused and in the same condition that you received it. Your item(s) must be in the original packaging. You will need to have the original receipt or proof of purchase. Once we receive your item(s), we will inspect it and notify you that we have received your returned item(s). We will immediately notify you on the status of your refund after inspecting the item(s). If your return is approved, we will initiate a refund to your credit card (or original method of payment). You will receive the credit within a certain amount of days, depending on your card issuer's policies. You will be responsible for paying your own shipping costs for returning your item. If we collect the item from you the cost of this will be deducted from your refund. Any additional shipping costs, paid for next day guaranteed delivery etc, are non-refundable.